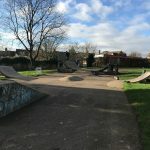 The skatepark at Oak Road is fairly small and basic but has an interesting shape making it a fun skate. 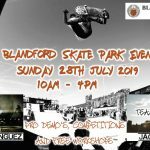 The centre of the skatepark has a fun box in the middle with an adjoining ledge and around the edge are two bowled corners with coping and a third edge with a quarterpipe flanked by two flat banks. 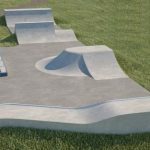 The size and the layout of the skatepark makes it a fun skate, especially if you are just starting out, and the arrangement of the obstacles means that you can skate seemingly endless lines. Hull train station: Exit Hull station onto Ferensway and head north when the road turns into Beverly Road. Keep following this road for a long time until it meets Cottingham Road, here turn right and follow it as it turns into Clough Road. When you see Oak Road on your left take this road until the end where you will see Oak Road Playing Fields where the skatepark is based. 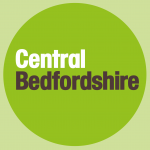 Haworth Street bus stop: Exit the bus onto Beverly Road and take the road named Beresford Avenue all the way to the end and you will reach Oak Road Playing Fields in which the skatepark is based. There are no on site toilets but there are free to use facilties nearby.